Model, Digital Photo Academy Workshop with Alexander Garcia, Feb. 2010. Photo by Mark Gordon. I’ve had portraits on my mind lately. I attended a workshop in Chicago put on by Digital Photo Academy, which is a Panasonic-sponsored series of workshops in various cities around the country. Unlike the “tour” workshops that hit a series of cities in brief succession, these are an ongoing series of one-day workshops by (mostly) local photographers. For $150 you get a full day of learning from a working professional photographer. I took a class taught by Alexander Garcia, who works for the Chicago Tribune. Three of the images from the class are shown here. And, it’s the contrasts between these three pictures that got me thinking. All three are of the same person: a great young photographer who served as the model for the day. She was patient and an usually good sport. My objective was to learn something and maybe add a picture or two to my portfolio. Mission accomplished. 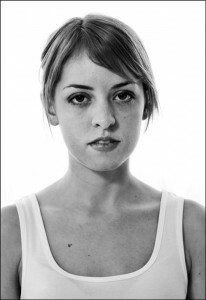 But, it does raise some questions in my mind about what portraits are all about and what constitutes a “good” portrait. Is the first color image, which certainly is more glamorous than the black and white a “better” portrait? Is the black and white a more “real” portrait? And the third image? 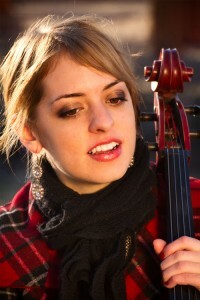 Is it maybe the most “true” of the three, since she is a classically-trained cellist? Do any of the three capture something significant about the subject? And, let’s not forget that the purpose of this exercise was not to create an honest or insightful portrait, but rather to learn a bit about lighting. This all leads me to jump off toward a small essay I just read by Vicki Goldberg in her “Light Matters” anthology published by Aperture. She includes a brief essay from 1992 about celebrity photographer Herb Ritts. It’s a nice companion piece to Philip Gefter’s 2007 essay on Annie Leibovitz, which I’ve previously written about. Model, Digital Photo Academy Workshop, Chicago, Feb. 2011. Photo by Mark Gordon. Goldberg’s succinct insight is that much of portraiture today is not about providing insight into the individual, but rather about marketing. The subjects of celebrity portraits were once as likely (or more likely) to be public figures in the government, military, business, religion and science as much as in entertainment. In today’s entertainment-centric society, almost all celebrity portraiture focuses on performers and portraits are collaborations between the photographer (Leibovitz being among the best known in this genre) and the subject. While photographers like Cartier-Bresson once aimed to steal the soul of the subject and put it on display for the world to see. Today’s celebrity photographers are more often co-conspirators in selling a carefully crafted image. Are today’s portraits, like so many of today’s celebrities, beautiful but soulless creations. Superficial images for superficial times? Or, is this just a case of selective memory. No one could possibly argue that Edward Steichen’s advertising images were any more honest than today’s celebrity portraits. And, that, really is Goldberg’s point. Whether you are marketing Corn Flakes or pop stars, it’s still marketing. This entry was posted in On Photography, Personal Photographs and tagged Alexander Garcia, Annie Leibovitz, Digital Photo Academy, Herb Ritts, Philip Gefter, Vicki Goldberg. Bookmark the permalink.